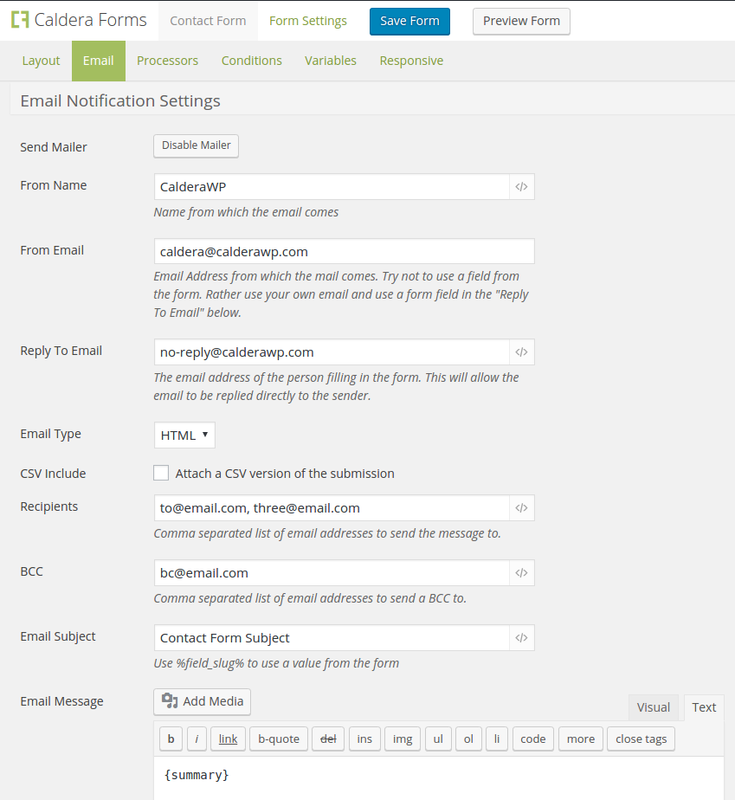 In the Caldera Forms editor, you can set an email notification to be sent on every form submission. This is turned on by default with every new form. You may also set up additional emails to be sent using auto-responder processors. This document covers setting up the main email notification. The email notification is intended to be used to send the site administrator or site owner a notification of a new form submission. It can also be used to send an email to the person who has submitted the form, even though the intent of the auto-response processor was to fill that role. 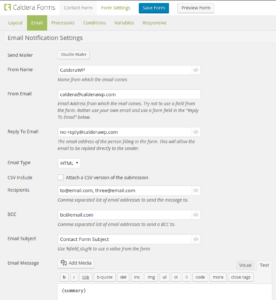 The first settings group for the Caldera Forms email notification. In the email tab the first set of settings after the disable button allow you to control the basic settings for your email: how it goes to, who its from and what its subject is. Let’s look at each of theses settings individually. Keep in mind that each of these fields can be set with a hardcoded value or the value of a field using Caldera Forms magic tags. Email Type Whether to send the email as HTML (default) or plain text. CSV Include If checked a CSV file of this form submission will be attached to the email. Recipients Who the email is sent to. You can send to more than one email address. Use a comma separated list of email addresses and/or magic tags for email fields. BCC One or more email addresses to send a blind carbon copy of the message to. The actual body of the message is created in the Message setting. This field uses the WordPress WYSIWYG editor. In it you can use text, Caldera Forms magic tags and WordPress shortcodes. Magic tags are especially useful if you wish to use values from the current form submission in the message. By default the summary magic tag is used in this field. This will show all fields in the current form submission. In many cases this default value is all you need, but if you need more control, please customize with any combination of magic tags, shortcodes, text and HTML you need. Below the message creation field are two checkboxes. These settings are useful for debugging mailer issues and ensuring both Caldera Forms and your server are set up properly. It is best to disable both of these settings when you are done testing. The first checkbox is Save Preview. This setting allows you to capture a preview of the message you are sending. This is the best way to ensure that your Caldera Forms email settings are correct for this form. 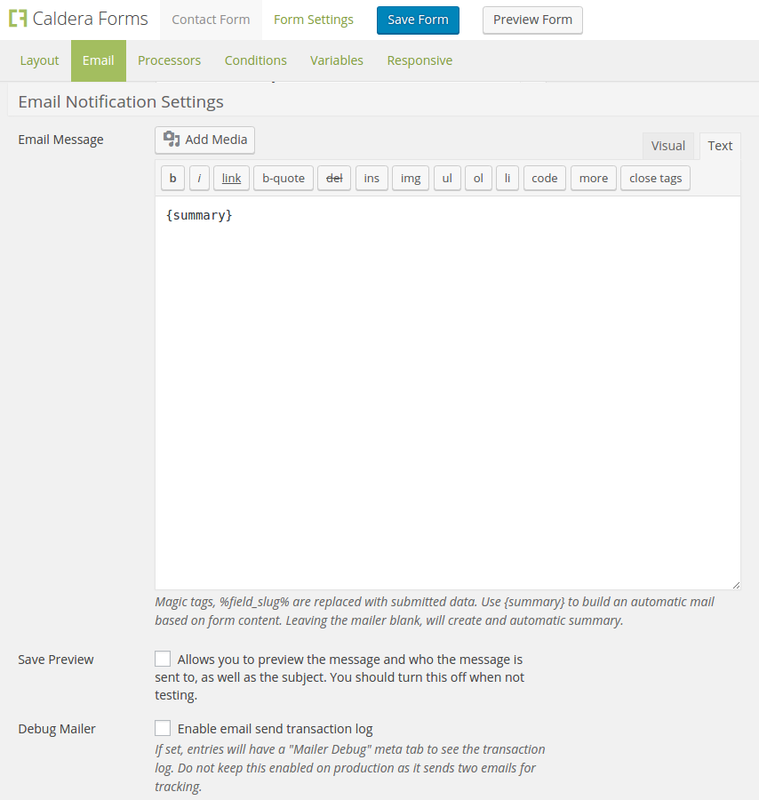 Email preview mode, which are documented here, is the best way, when emails are not sending properly to ensure you have configured your settings properly. The second checkbox is Debug Mode. When this is enabled, all details of your email will be saved and accessible in the entry viewer. This information is useful for finding server configuration errors affecting Caldera Forms emails. If the form submissions are appearing in wp-admin’s entries view, but the emails never send, your server may be to blame. The ability of Caldera Forms and all other form plugins to send emails is dependent on WordPress’ mailer functionality (wp_mail), which is not terribly reliable across all server configurations. You can read about this common problem and potential solutions for it here.